Image from Bower Power Blog. 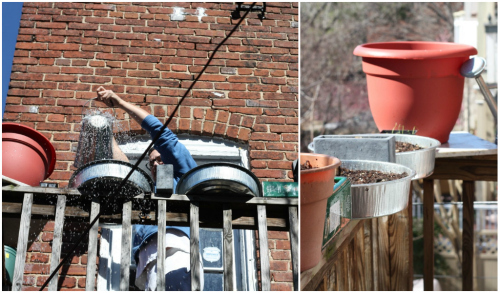 In a continual effort to maximize the tiny patio space we have in our new home for urban gardening, we've been trying to come up with as many creative ideas to make use of vertical space as we can. 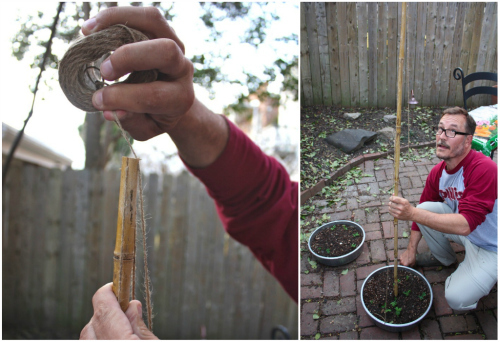 After getting inspired by the self imposed Pinterest Challenge hosted by fellow Richmond bloggers, Young House Love, and the endearing Katie Bower of Bower Power Blog, this was just what we needed over the weekend to finally tackle a project we've been wanting to take on for months now — making DIY bamboo teepee supports for our pea plants. 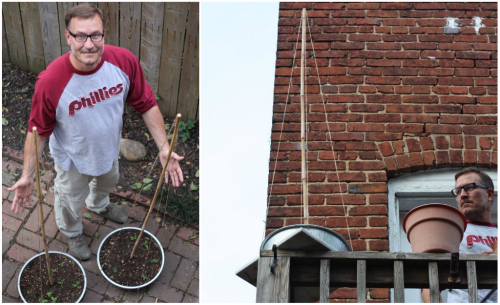 We had plans to build supports for the peas we planted in these shallow galvanized containers we bought early last month during a trip to our local farm supply center (they are more commonly known as utility pans or livestock feeders). 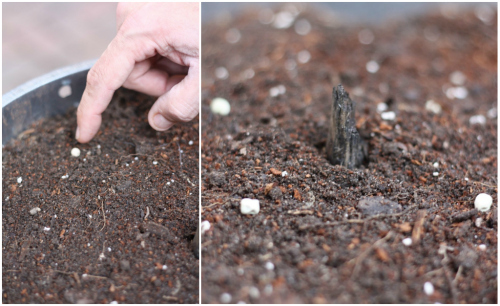 To save time, we went ahead and planted the seeds to get them started, knowing we'd be able to build supports later once the plants had sprouted. Now that the peas have more than sprouted and are beginning to form that classic vine shape, we knew we'd better get a move on building out the supports before it was too late. We've long wanted to build out elaborate garden teepees, alas in our new home, we are seriously lacking in space — so we had to get a little creative. Original Sources: 1. Bean Teepee. 2. Natural rhubrab cage. 3. 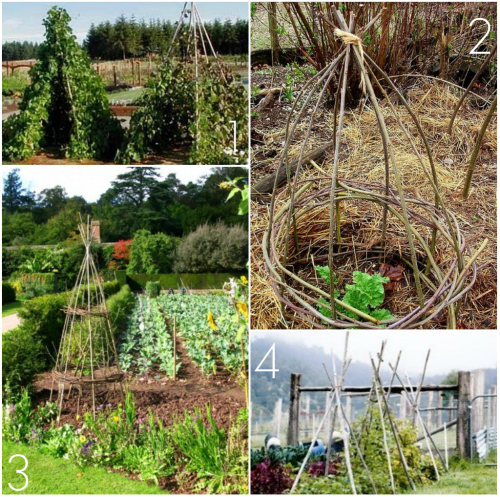 Vegetable teepee support. 4. 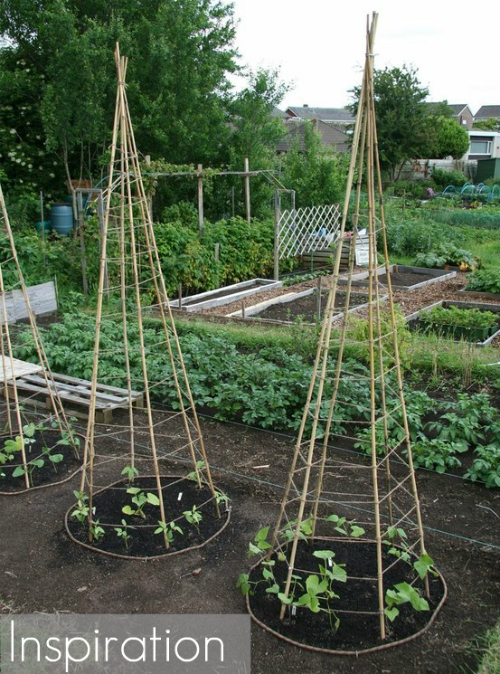 Vegetable garden supports. The versatility of this idea is what makes it such a fun one to tackle. 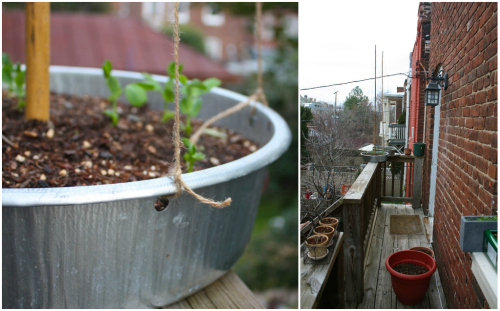 This project could be done in so many different ways — from changing up the planter, the variety of vine plant and the design of your supports. We selected the utility farm pans for their shallow and wide nature, knowing peas have shallow roots and "crawl" up vertically as they continue to grow — perfect for vertical gardening. 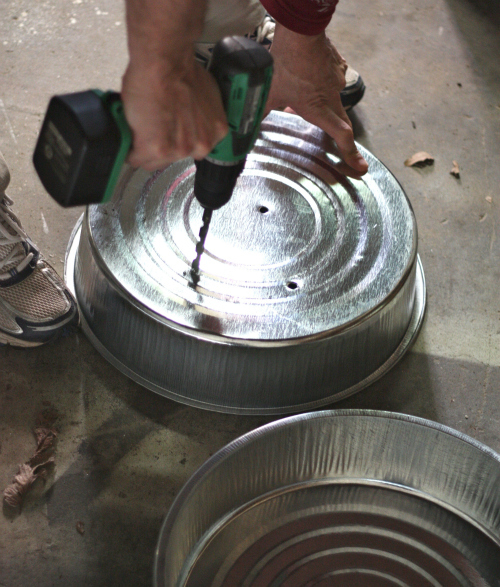 To transform these containers into planters, Tim flipped them upside down and drilled holes into their bottoms to allow for proper drainage. 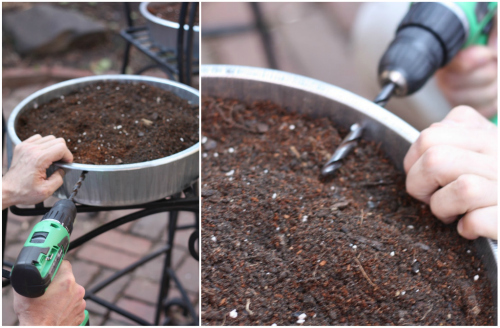 We then filled each pan with a thin layer of mulch (again, for drainage), followed by a mixture of dirt and potting soil. Tim drilled four more holes along the outer top rim equidistant apart to create what would later become the four anchoring corners of our teepee supports. This step could and probably should be done before putting soil into the planters, but the soil did help weight the containers down (please don't judge our makeshift patio chair workstation). 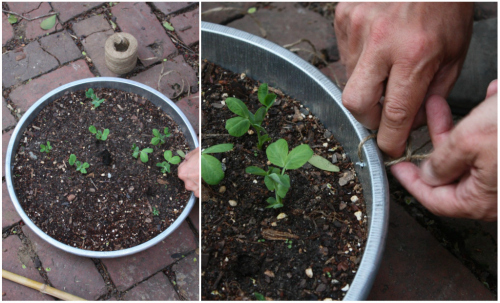 After drilling, we planted pea seeds on either side of each hole around the edge of the pan and 4 in the middle, marking the middle with a piece of mulch so we'd later know where to place the center support. 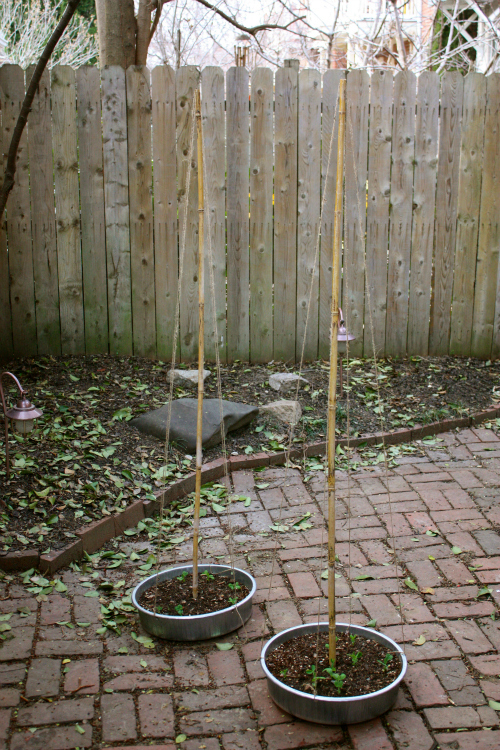 We went with an organic variety of garden peas we had picked up at our local garden center last year and planted them in this formation to further position them for climbing up the jute supports. 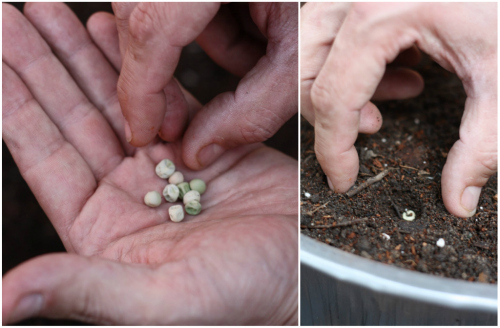 Tip: When planting seeds, it's a good rule of thumb to simply lay the seeds over-top your soil and gently push them down only as far as the depth of the actual seed is — you can see where Tim pushed the pea down and simply pinched the remaining soil back over it to lightly cover. 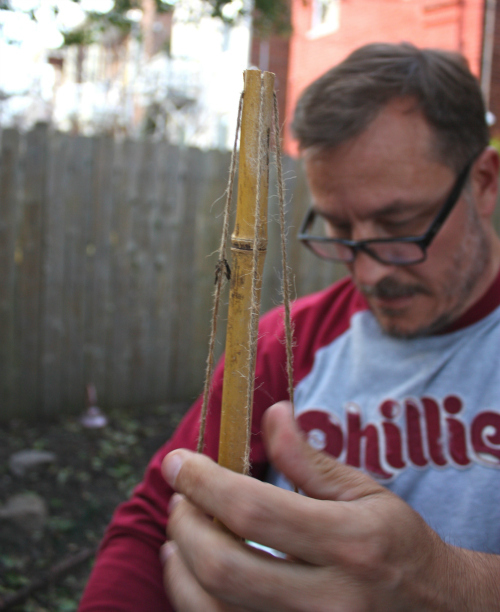 After initially knotting the twine through one of the holes in the planter, we slid the base of the bamboo stalk into the center of the planter (where we had previously marked with a piece of mulch). 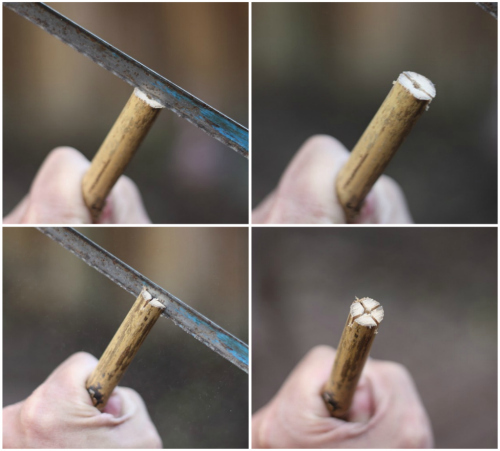 I held it steady while Tim measured and cut pieces of jute twine long enough to tie through each of the drilled holes, string through the top notch of the bamboo stalk and tie tautly through the hole across the other side of the planter. 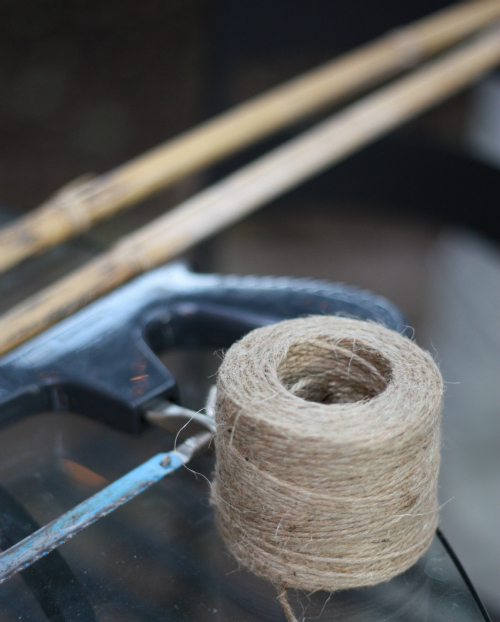 Tip: Cut the jute twine longer than you think you'll need to account for tightening, you'll want to make sure your support twine and center bamboo anchor are taut and held in place. That was it! 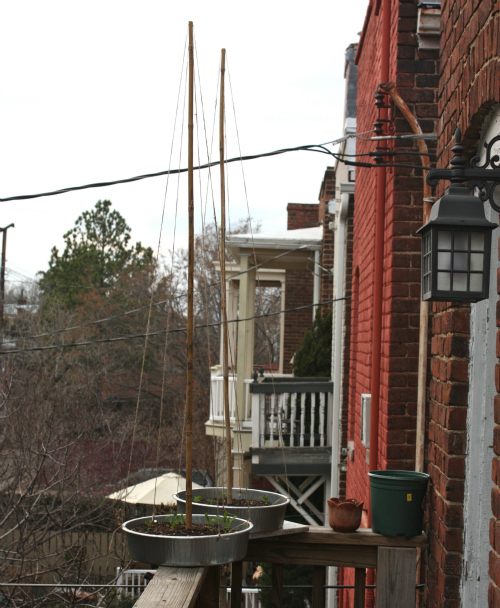 We've now made our own versions of teepee bean supports that work with our own urban setting. One great part about making them in containers is their mobility. We will be able to move them as we need and get more acquainted with where optimal sun can hit them. For now, they went right back up to the sunny part of the deck to keep on growing. Anyone feeling a little claustrophobic? 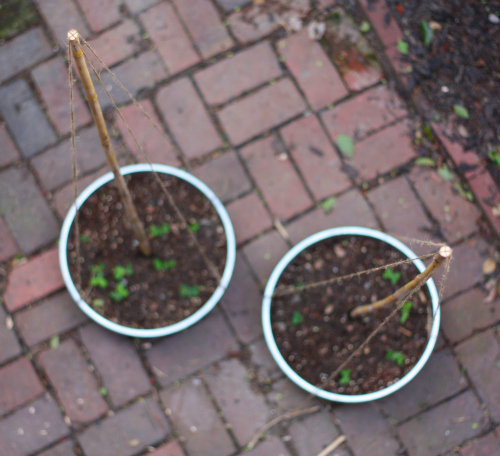 As the plants get larger, we'll guide the vines along to grab onto the twine supports and then they will simply crawl on up those twine legs all on their own. We're so glad we were actually able to create something like this to work with our space that turned out to be so cost effective and pretty simple to make, given the right tools. We're even more thrilled that we're now at the stage where we can simply maintain the plants as they grow and wait for those garden peas we'll soon be enjoying. We're definitely inspired to try additional designs for other vine plants as we get them going, for example, cucumbers and tomatoes. We'll be sure to keep you posted. 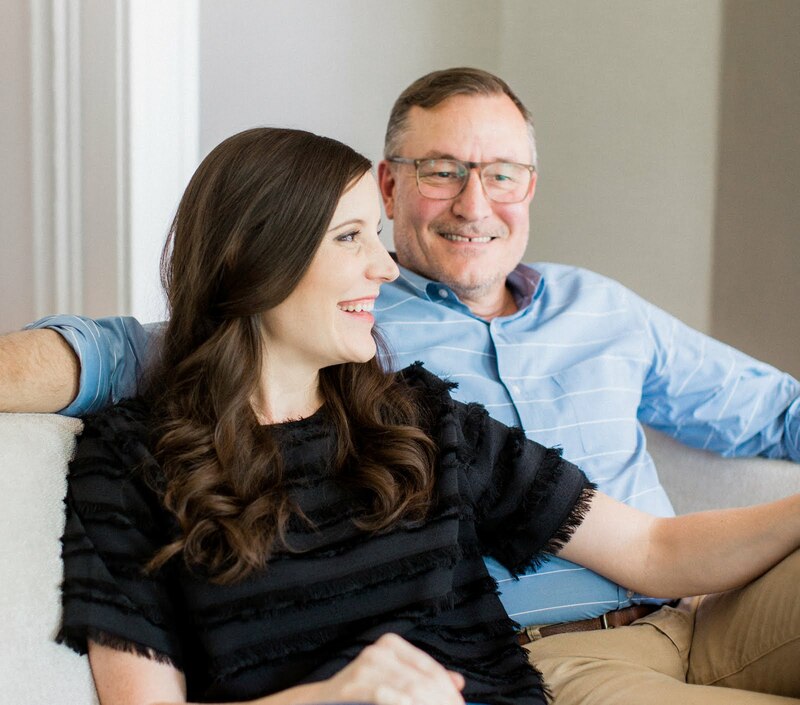 Also, if you haven't, take a moment to check out all the other great projects shaping up across the blog world today spurred by this Pinterest Challenge — great places to start are with Young House Love & Katie Bower. Also guest hosting this season were Cassie of Hi Sugarplum and Erin of The Great Indoors. We've already discovered so many inspiring projects and new-to-us blogs to add to our own readers. If you joined in the challenge this season, we'd love to see what you were inspired to take on as well! P.S. Keep up with all of our urban gardening adventures here, our gardening pins here, and if you aren't yet on Pinterest yourself be sure to let us know in the comments and we'll be happy to send you an invite! With the beautiful weather in Georgia this weekend I'm remembering that we need to get on our garden for this year! We just make take a page out of your book and make a support for our beans. Great job, and thanks for linking up with the Winter Pinterest Challenge! How well are the beans growing in the pans so far this season? 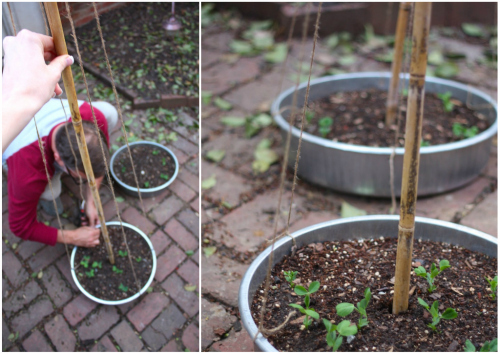 Our peas grew quickly up the strings and produced a great little crop for the two of us. It's been really hot here in VA and the vines have since dried up after our first couple rounds of peas!